Since Christmas came early for us this year, so did decorating, and so does de-decorating. When my sister and I were kids, we loved Christmas so much that we convinced Mom to leave the decorations up until at least January 6, the date of the arrival of the Magi. I dated a woman once who loved her tree so much she left it up until the first day of spring. To facilitate this de-decorating effort, I found eight red Christmas totes (plastic tubs with lids) in, get this, the Christmas tote section of Wal Mart. They were on sale on December 26. The reason is that some of the Christmas stuff was in broken plastic bins, while other items were in cardboard boxes. This should help to reduce the overall off-season rattiness of it. At least two of the totes contain some form of garland, and not being one to leave a good joke alone, I named it all Judy Garland, and their boxes are named Judy as well. 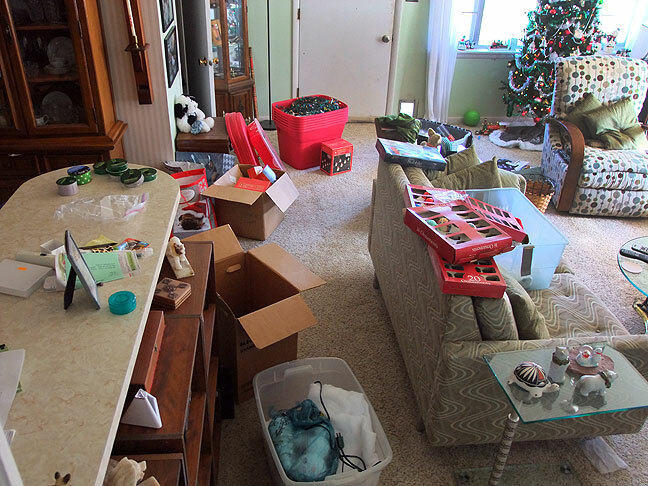 O, after Christmas mess, who can frame your fearful symmetry? Ha. We’ve visited the Christmas Tote Section before, and now have several sturdy green/red totes to hold the holiday bulk.